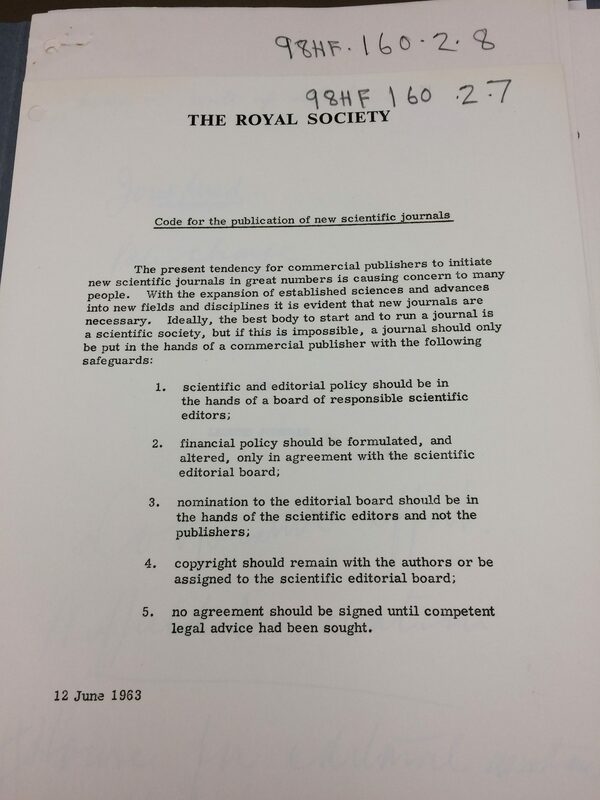 This 1963 document outlines the Royal Society’s proposed ‘Code for the publication of new scientific journals’. The Code was written at a time when the presence of commercial publishers was becoming more apparent in the world of scientific journals, and concerns were being raised over ownership and control. The Code insists that the ideal body to run a journal is a scientific society, but if that is not possible, then editorial and financial policy should be in the hands of academics, and that copyright should be retained by authors. It is not (yet) entirely clear to us what happened to the Code after 1963. The Royal Society was trying to provide leadership to other societies, in publishing and other matters. The meetings with other societies continued for at least a few years; and meetings of journal editors were emerging in the USA around the same time.